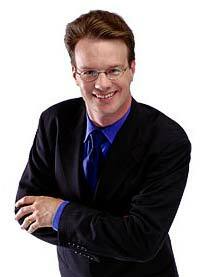 Ever since he wrote to me, I’ve been in communication with Mark Rowswell (AKA Dashan) via e-mail. Well, this past weekend he came to Shanghai to shoot a few commercials, so we got together for a chat. As a public figure, he really has to watch his image, and there’s a lot he doesn’t talk about publicly. It was really interesting, then, to meet Mark and hear some of his opinions. We talked about a range of topics, including English education in China, the meaning of the recent loss of the Stanley Cup to Canada (go Tampa Bay! — I guess), what it was like to be a student in Beijing in 1989, and running a website (he manages his site and all its content all on his own). I spoke with him on the set of his commercial in between shots. I have to say that observing the shooting of a commercial is both interesting and very boring. Once is enough. I’d hate to have to do it to pay the bills. After the commercial he treated my girlfriend and me to dinner. I never would have guessed where he wanted to eat — Malone’s! It’s quite the expat hangout, and although it’s not the cheapest, the burgers are really good. Anyway, it was good to meet someone so high profile and yet so poorly understood as Mark. We also discussed some small projects we may be collaborating on in the future. Stay tuned. Did you ever take a look at my Derisive Dashan? Mainly because Dashan’s image is squeaky clean and all-around nice, it’s funny to see him get “belligerent” in Chinese on the page. Well, I just got an e-mail from Dashan. I never intended for Dashan to see the page (or my blog entry about him, which isn’t completely complimentary). I didn’t realize, though, that because of Derisive Dashan Sinosplice had taken over the #2 spot in the Google search for “dashan,” second only to Dashan’s official site. Anyway, apparently Dashan has been aware of the page for some time. He presented his case, asking if I could take it down now. 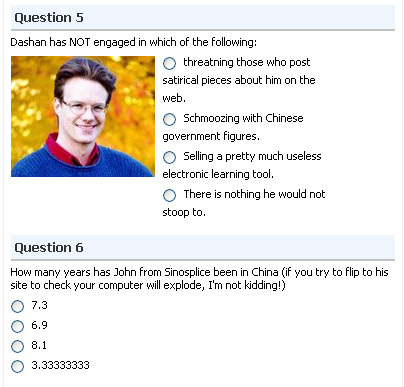 I’m a reasonable man, and deep down I know that Dashan really is a good guy. It’s not his fault that Chinese people are always comparing other foreigners to him. So I took it down. I guess it wasn’t really a good idea to publicly target a specific person for ridicule. I’m not normally the type of person to do that, but Dashan definitely feels more like an institution than a person. Until he sent me an e-mail. Sorry about that, big guy. Recently I was trying to design desktop wallpaper that would remind, encourage, and inspire me to study Chinese more. In doing so, I hit upon an amusing idea. Dashan is involved. (Unfortunately, it’s not nearly as interesting if you don’t read Chinese.) It’s a new Sinosplice original. Anyway, check out Trash Talking Dashan!